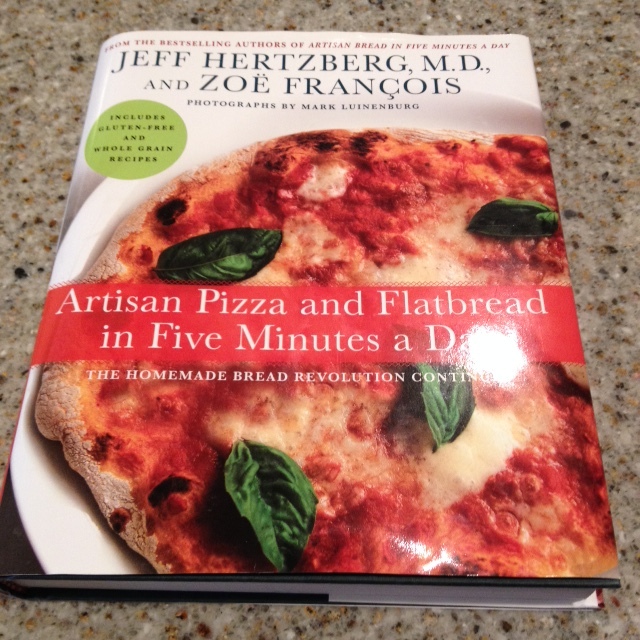 In 2007 Jeff Hertzberg and Zoe Francois, authored, “Artisan Bread in Five Minutes a Day: The Discovery That Revolutionizes Home Baking” and it does just that! You simply mix the recipe ingredients in a large bucket, cover and let the dough rise at room temperature for about 2 hours; then refrigerate for up to 2 weeks. You will have enough dough to make 3-4 loaves of bread or 3-4 pizzas with very little work. Once I discovered the Artisan Bread method, I have been making most of my breads following their process. If you would like to know more about this method visit their website: http://www.artisanbreadinfive.com/. 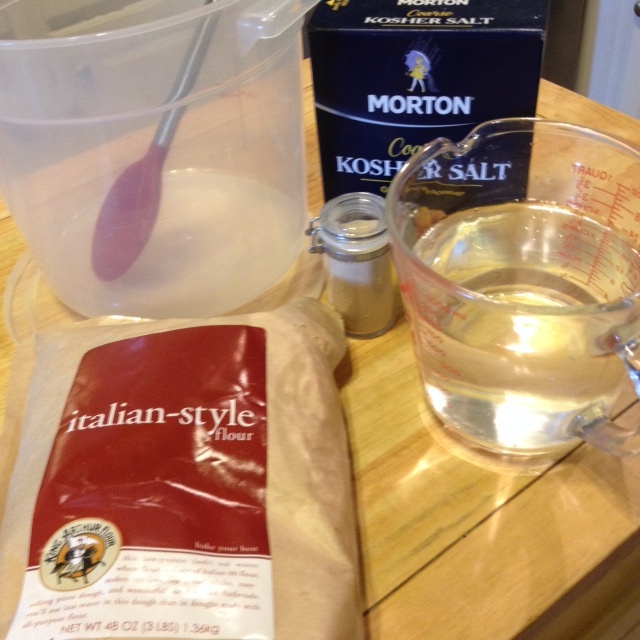 The authors have recently written a book on how to make gluten-free bread with this method. I like to use Italian “00” flour for making pizza. Italian “00” flour is lower in protein and makes a supple, smooth and easy dough to shape.The “00” refers to the grind of the flour and this flour is fine-textured. The resulting baked goods are light, airy and have a crisp snap to the crust. It’s ideal for pizza, flatbread, focaccia and crackers. I purchase the flour from King Arthur. Of course, you can use other types of flour but the ingredient amounts will vary slightly. I use the method and recipe for the dough from “Artisan Pizza and Flatbread in Five Minutes a Day” by Jeff Hertzberg and Zoe Francois. The bucket should not be airtight, so leave the lid ajar or, do what I did, drill a tiny hole in the top center of the lid. Pour the oil into a rimmed baking sheet and sprinkle the minced garlic over the oil in the pan. 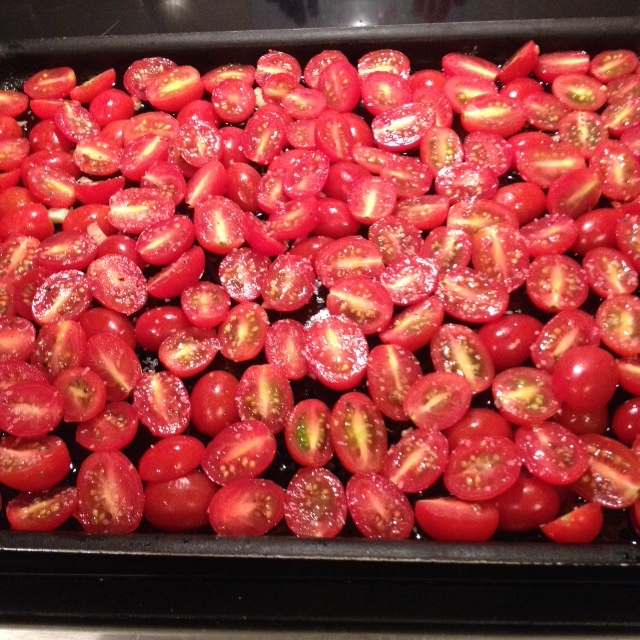 Place the tomatoes in an even layer on the baking pan and sprinkle with salt and pepper. 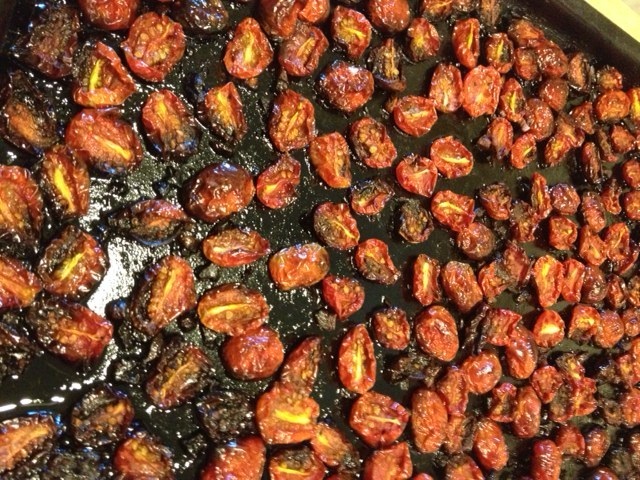 Bake for about 90 minutes until the juices have stopped running, the tomato edges are shriveled and the tomato pieces have shrunken slightly. Make ahead and store in the refrigerator. Pour the water into a 5 quart bowl or lidded food container. Add yeast and salt to the water. 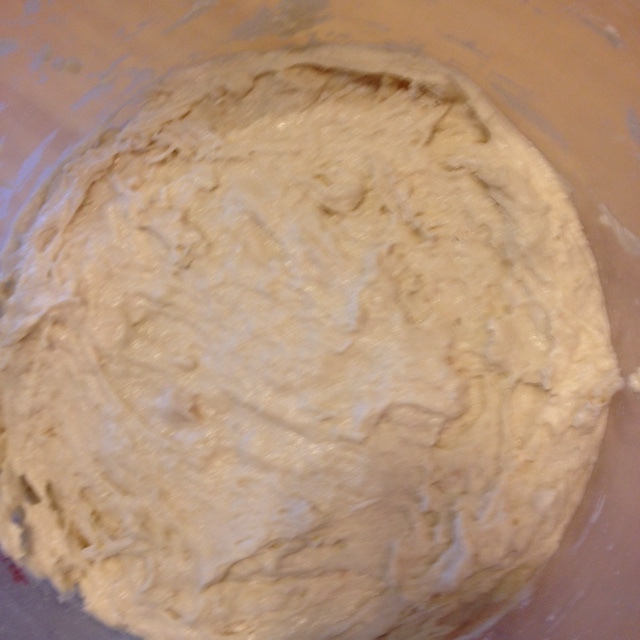 How the dough looks after it is mixed. Cover, but don’t seal the lid tightly, and let the dough rise at room temperature until it begins to flatten on the top (about 2 hours). DO NOT PUNCH DOWN THE DOUGH! 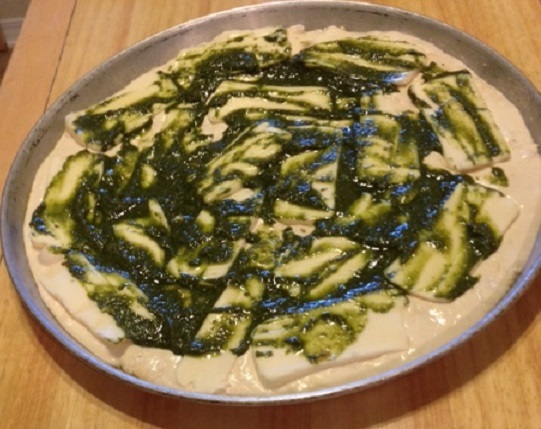 This method is designed to retain as much gas in the dough as possible. 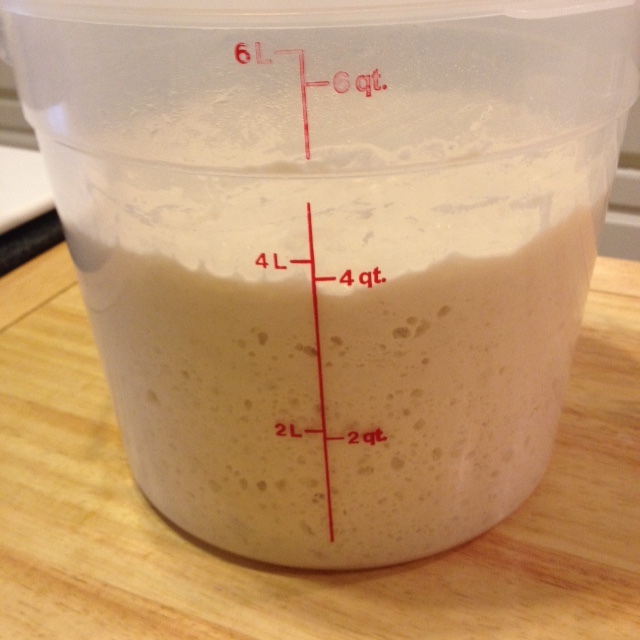 After rising, refrigerate the dough in the container and use the dough over the next 14 days. Once it’s refrigerated the dough will collapse and it will not rise again in the container — that’s normal. Extra dough may also be frozen with equally excellent results. 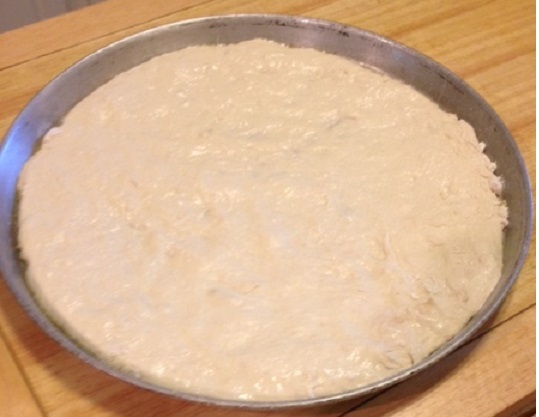 Pull up and cut off a 1 1/3 pound piece of dough from the container of refrigerated pizza dough. My pizza pans are large, so I usually get 3 pizzas from a batch of dough. Hold the dough in your hands and dust your hands with flour, as needed, to keep the dough from sticking to your fingers. Form a ball, by stretching the surface of the dough around to the bottom on all four sides and rotating the dough a quarter-turn as you go. Place the ball in an oiled pizza pan and press and stretch the dough to the edges of the pan. Cover with a kitchen towel and let rest for 30 minutes. 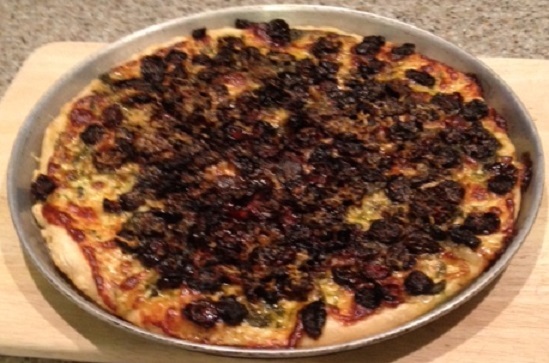 Preheat the oven to 450 degrees F.
After the dough has rested, add the toppings. Place the sliced mozzarella on top of the dough. Spread the pesto sauce over the cheese layer. Distribute the tomatoes evenly over the pizza and grind some fresh black pepper over the top. Place the pizza on the bottom rack in the oven and bake for 15-20 minutes. Let rest 5 minutes before cutting. This will be one of the best pizzas you have ever had. I must get back to making pizza dough! This method sounds wonderful. Nothing beats the taste of homemade pizza. Love, love, love this post. Am pretty sure that you’re reading mind lately. 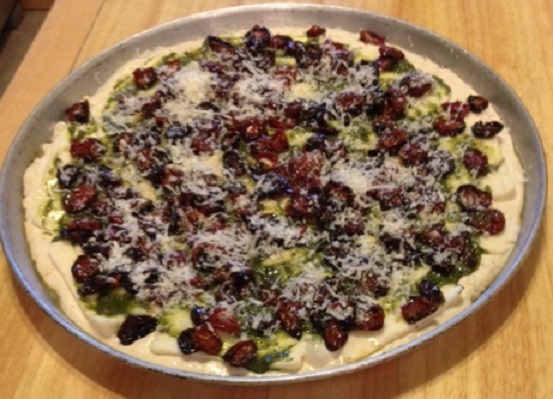 Can’t wait to try this speedy dough pizza recipe! The smell when this dough bakes is amazing! Calzones or pizza are so easy. I make calzones and freeze them for my daughter a lot. My heavens how did I miss that cookbook? I’m not only addicted to buying fabric I also collect bread cookbooks + many others and I don’t get rid of any 😦 My poor hubby is ready to tear his hair out. But he enjoys cooking and baking too. And incidentally we are having pizza tonight. Do you think we are on the same wave length ? It’s a good thing we just had lunch or I might be eating the screen. Thank you for sharing, I always like pizza ideas. Enjoy your pizza – wish we were having it tonight. Thanks for sharing. Looking forward to making this Pizza Recipe. I have three of their bread cookbooks. The last one I bought was The NEW Artisan Bread in Five Minutes a Day. 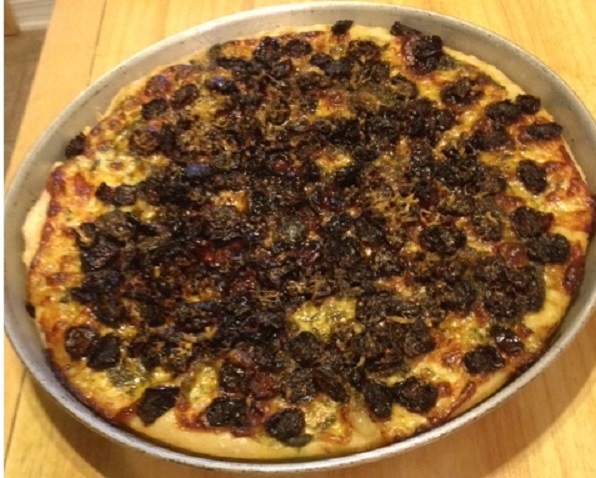 The bread is okay–too wet for my tastes–but the original recipe makes wonderful pizza dough!! Probably the best pizza dough I’ve ever made! I agree – pizza dough recipe made this way with any flour seems to be so much better. It may be the refrigeration that makes the dough taste so good. I agree–and it’s so handy to have that dough ready in the fridge when you want to use it! !